Windows built-in backup program is not a perfect backup tool. And each edition of Windows’ backup programs are different, there is no continuity between the neighbor versions. You see, the backup program in Windows XP, Windows 7, Windows8 and Windows 10 are not the same, neither GUI nor functions. What’s worse, they have many limitations. The most important thing is that you have to enter the system to restore, if you can’t enter the system successfully, you can’t run the program. Other disadvantages such as the volume of images are very big, restoring time is too long, etc. Windows only provides a platform which can’t do everything well. Luckily, there are many excellent but free third-party Windows backup software in the market. AOMEI Backupper Standard is one of them, next, I will introduce you it detailedly. AOMEI Backupper Standard Edition is a freeware. Usually, when we talking about AOMEI Backupper, is its Standard Edition, this edition is used by most users. 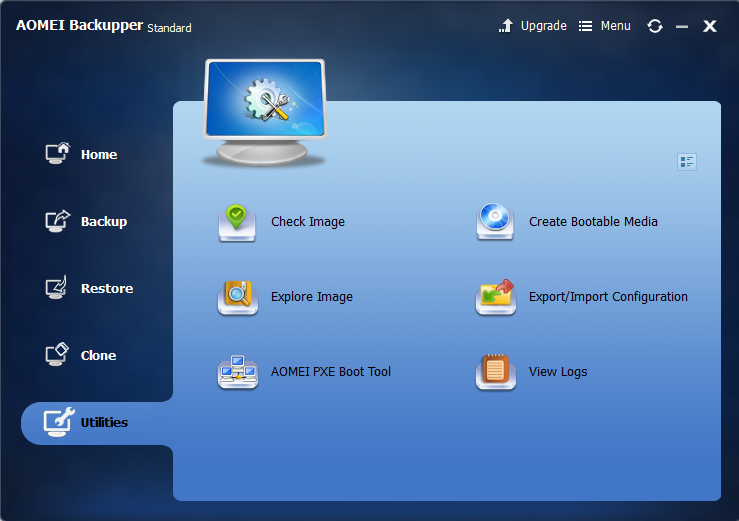 Another free edition of AOMEI Backupper is AOMEI Backupper Standard for Win 7, which does not support Windows XP and Vista. There are six editions of AOMEI Backupper, two free, four paid. Other editions are AOMEI Backupper Technician, AOMEI Backupper Technician PLUS, AOMEI Backupper Professional, AOMEI Backupper Server. For common people, AOMEI Backupper Standard is enough. Now, let’s see what functions it has. At first, backup functions: system backup, backup Windows and system settings without interrupting your work. Disk backup, both internal and external disks can be recognized by Windows. Partition backup, file backup and even file sync. It supports four kinds of backup schemes: full backup, schedule automatic backup, incremental and differential backup. About restore, there are system restore, disk restore, partition restore, file restore, selective files restore and universal restore – which is able to restore a image file on a different computer with dissimilar hardware, or migrate system from physical to virtual machine. It is worth mentioning that the latter two features are paid in some backup software while in AOMEI Backupper Standard, they are totally free. AOMEI Backupper Standard is a clone software as well. 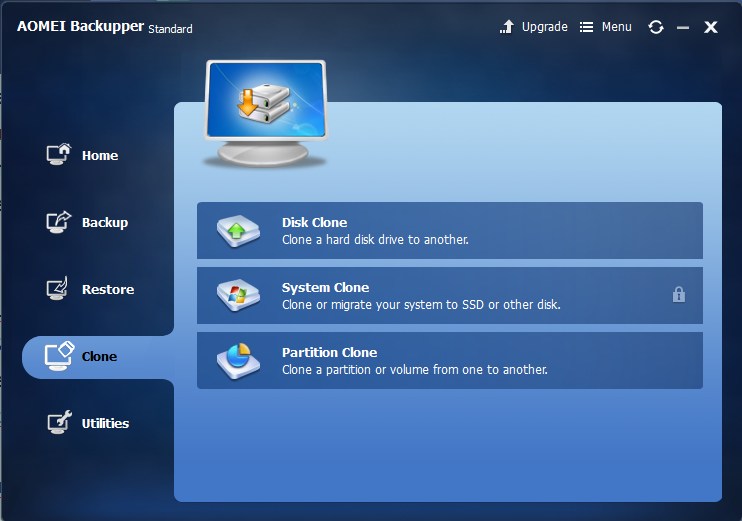 System clone also means Migrate OS to SSD. Usually is SSD, thus is meaningful. AOMEI Backupper Standard will help you achieve this without re-installing Windows. Please note that you should unlock it first in this edition. Then comes to disk and partition clone, the highlight is that it allows resizing partitions during the cloning process, copy a large disk to a small one. Check Image: check the data integrity of the image. Explorer Image: explorer image by mounting it on virtual partition. PXE boot tool: boot multiple machines within the same LAN via network by loading image. Practical for administrator. Create bootable media: make a bootable rescue media such as CD or USB. Export/import configuration: export all backup tasks saved in a file which can be imported later. View logs: view records that happen during a backup process. AOMEI Backupper suppports all mainstream Windows operating systems, from the earlier Windows XP to the latest Windows 10. It always keeps up with the time. It supports various file systems: NTFS, FAT32, FAT16, EXT2, EXT3 and so on. Supported storage devices are also many: Internal hard disks, External hard disks, Solid-state drive(SSD), Thumb Drives, USB flash drives, Network-attached storage(NAS), Hardware RAID, Dynamic Disk and Virtual machine system, etc. So you can backup to NAS, backup dynamic disk volume, backup GPT disk partition, etc. If you haven’t used AOMEI Backupper before, you’d better learn how to use it from the official website, there are many articles and tutorials. You can also watch videos on Youtube. Read review in software websites and magazines. By the way, AOMEI Backupper gets many rewards in software field. How to use AOMEI Backupper? We suggest you download it from the official site or famous software download site, for example: CNET, softpedia, Download 3K. Install and run, the Standard Edition is free so that you don’t need to input license code. I have used AOMEI Backupper for a long time. The GUI and theme are consistently. The main color is blue, deep blue mixed with light blue, I love this style, very comfortable. What’s more, the steps of every goals are few. Each step has guides. And the backup speed is quickly. Now AOMEI Backupper inbuilt multiple languages: English, German(Deutsch), Japanese(日本語), French(Français), 简体中文(Simplified Chinese) and 繁體中文(Traditional Chinese). For other languages, you can replace the language file under the installation directory. You can also help them translate if you are interested in it. Although AOMEI Backupper Standard Edition is free, it only works on Windows PC, if you need to backup server, you have to use AOMEI Backupper Server or higher editions. If you want to use command line to backup, clone, restore and enjoy disk space management, merge backup images, you should buy AOMEI Backupper Professional or advanced editions. About the pricing, AOMEI Backupper is cheaper compare to similar backup products. Each paid edition of AOMEI Backupper has two prices – Free lifetime upgrades or without free lifetime upgrades. We suggest you compare the functions and prices first then buy later. 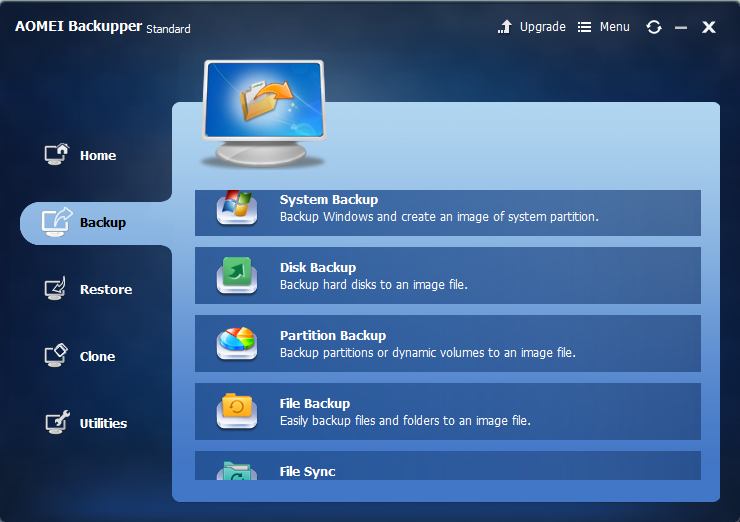 AOMEI Backupper is a full-scale Windows backup software, the Standard Edition is known and used by most people. Because it is free that it wins the favor from users. As the statement of AOMEI Technology: optimize system, optimize life. Backup is an important aspect when using computer. Develop a backup habit is good. In a word, with the help of AOMEI Backupper Standard, you can maintain your system better and make your life easier.